Is Dell planning to make a laptop with two detachable displays? A newly discovered patent from Dell suggests the company is designing a laptop that can handle two detachable displays. The patent, named “Information Handling System with Multiple Detachable Displays”, includes diagrams of a laptop that can be used like a traditional device, with a single screen above the keyboard, or with two screens attached. This could be a big boon for productivity, as it would allow people to extend their desktop space, essentially working on multiple monitors. According to the patent, the laptop can be used with both screens facing the user, or one screen facing forward and the other backward, which could be used for presentations. 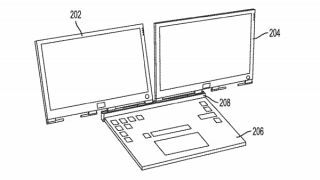 The patent also explains how a potential dual screen Dell laptop could attach and detach the screens, with the displays clipping onto a bar via an adjustable clamp. While we’re not expecting to see a dual screen Dell XPS 13 any time soon, it’s good to know that the laptop maker is looking into new form factors for Windows 10 laptops.